Arab citizens are one fifth of Israel’s population. Most are Muslim, others are Christian, Bedouin, and Druze. Many live in exclusively Arab towns and villages, while others reside in mixed cities such as Haifa and Akko. Most are Israeli citizens, but many residents of East Jerusalem are not. Some regard themselves as Israeli Arabs; others call themselves Palestinian citizens of Israel. While diverse in its own right, this sizable minority is a significant component of Israel’s diversity. One third of the Negev’s citizens are Bedouin. Our ancient Jewish law and traditions teach: “Do not mistreat a stranger or oppress him, for you were strangers in Egypt.” (Exodus 22:21) Equality and shared society for Jews and Arabs in Israel deserves to be high up on the list of Israel’s priorities. The promise that Israel would be a “light unto the nations” is one of the state’s fundamental founding principles. I think working for equality and shared society in Israel is good for the Jews. Our projects in Israel must lead toward a socially cohesive society that is stable, and safe. My vision is for all residents in Israel to feel, and actually be, at home. Everyone’s dignity and human rights must be respected, with every individual enjoying equal opportunity. It is tolerant. It respects diversity. It is the future. It must be the reality. The Arab community’s economic development – employment and higher education, specifically — has become a government priority in recent years. Major initiatives are being launched with unprecedented government funding invested to close employment and education gaps, often building on innovative programs initially developed within civil society, including efforts our Federation is supporting. Funding is on the rise for social cohesion, inclusion, and integration. During February and March, I spent five weeks in Israel. After participating in the Board mission of the Mack Ness Fund of the Jewish Community Foundation of Greater Metrowest NJ, I spent three weeks in the Negev volunteering at projects funded by our Federation. I attended the Social Venture Fund for Jewish-Arab Equality and Shared Society (SVF) Israel mission, as well as the Jewish Funders Network Israel Conference. The SVF was awarded The Shapiro Prize by Jewish Funders Network, recognizing alliances of forward-thinking Jewish funders whose collaborations positively impact chosen fields of interest. 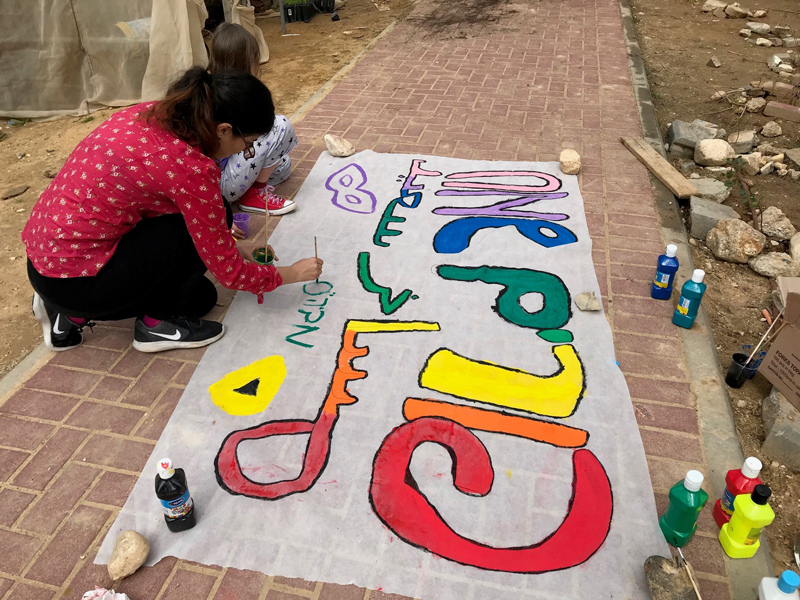 Thanks to Karen Abu Adra, director of partnership, and Sam Shube, executive director, I volunteered at Hagar: Jewish-Arab Education for Equality, in exchange for home hosting with two Bedouin families in Lakiya and a Jewish family in Beer Sheva. This was a warm and welcoming experience on every level. Hagar is the only bilingual Hebrew and Arabic school in the Negev. It has a nursery (age 1 and up), kindergarten, and elementary school for more than 350 Jewish and Negev Bedouin children. Future plans include an alumni Jewish and Bedouin scout troop and a bilingual high school. I taught English and art. We sang songs, danced the hokey pokey, and talked sports, colors, shapes, numbers, letters, body parts, and animals. 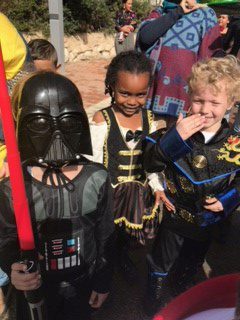 Students gear up for Purim, a huge holiday in Israel: face painting, making signs and floats and wearing costumes. Because parents choose to send their children to this special place, the dedication and commitment of both parents and teachers is dominant. There are two teachers for each subject, one speaks Arabic, the other Hebrew. I joined the art class, where we spoke in English and helped children create amazing artwork. Leading up to Purim during the month of Adar, students prepare for the costume parade. Everyone, including my Bedouin host, exchanged mishloach manot to bring peace and harmony. The parade engages all — kids, parents, and teachers wear costumes, neighbors watch, music is played. With so much diversity celebrating Purim, this holiday left me with great optimism and a memorable place in my heart. Purim will never be the same for me! During my last week of volunteering in the Negev, I stayed with a Jewish couple from Beer Sheva. Hanita Hadad teaches at BGU, her husband works in Ramat Negev Regional Council, which is the largest regional council in Israel, covering well over a million acres, or 22 percent of Israel's land-area and many Bedouin unrecognized communities. We visited Hagar nursery school where 30 one-year-old children hug, stay, play, and grow together. This experience reaffirmed for me that we must continue to support and champion changes to create a shared society and address one of the most important and sensitive issues affecting the future of Israel. By doing so, we will fulfill our sacred mission of serving as an Or Lagoyim, a light unto the nations. The promise that Israel would be a “light unto the nations” is one of the state’s fundamental principles. Phyllis Bernstein lives in Westfield. She is a Board member of the Mack Ness Fund of Jewish Community Foundation of the Federation of Greater Metrowest NJ and co-chair of economic development committee of the Social Venture Fund for Jewish-Arab Equality and Shared Society.